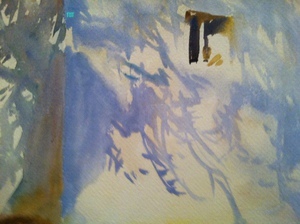 Sargent, "Lights and Shadows," 1909, iphone detail. In the last six months or so, watching the baby learn to name her surroundings, I’ve found again and differently how much of the pleasure of looking is naming. To know what a thing is called is to see it with a distinctness that, nameless, it lacks. One pleasure of Impressionism is of making out what’s there – that is a face, a hat, a shadow, a boat upon the water, a reflection. 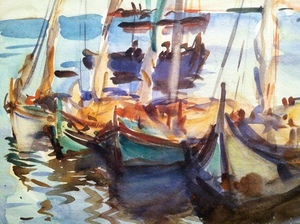 The Impressionist styles of painting slow down the eye’s recognition enough that you can feel, again, the early pleasure of coming-to-know-what’s-there. 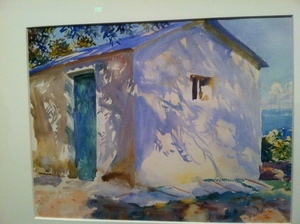 This is also a pleasure of Sargent’s work. 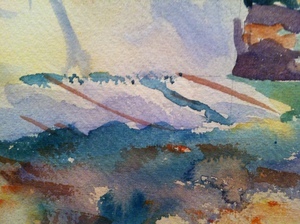 Though he was not an Impressionist, he developed just a little later and responded to some of the same influences. 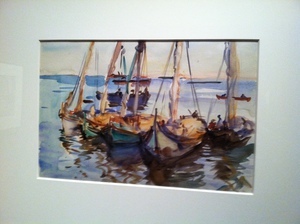 Many of the watercolors that are part of the exhibition are from the latter half of his career. 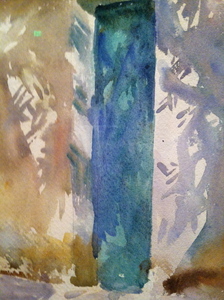 Watercolor is a great late medium: translucent, indelible, it requires judgment and assurance from its maker.